[+] Spider Identification Chart | Venomous or Dangerous? Spider Identification: Dangerous - Venomous? Apply online for a FREE Spider Identification Chart with FIRST AID spider bite procedures - colour A4 size - laminated Ready Reference Guide to common Australian spiders. Featured are the Sydney Funnel Web Spider, Red Back Spider, Wolf Spider, White Tail spider, Black House Spider, Huntsman Spider, Daddy Long Legs Spider, Yellow Sac Spider, Golden Orb Weaver Spider, Harvestman, Jumping Spider, Australian Tarantula Spider, Recluse Spider and other spiders with notes to aid in identification. 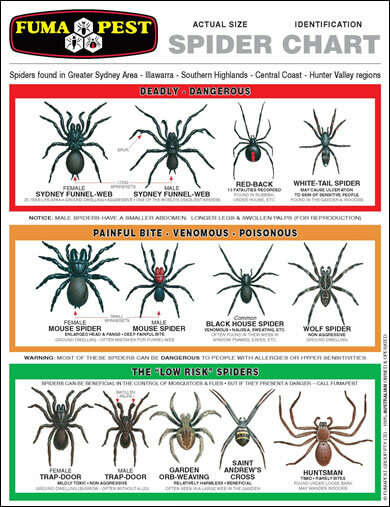 Spider Identification Chart features some of venomous and dangerous Australian spiders, with notes on their habitat areas, venom toxicity and spider bite first aid procedures. Click on a Spider for more details.